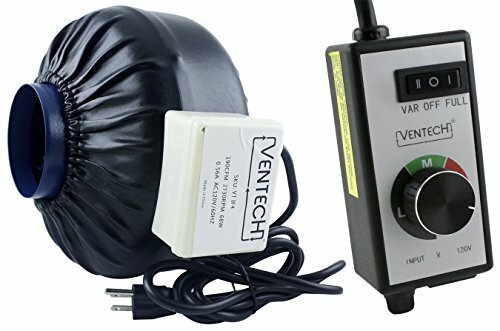 VenTech VT IF-4-B Inline Exhaust Blower Fan with Variable Speed Controller, 190 CFM, 4"
Product prices and availability are accurate as of 2019-04-17 17:21:14 EDT and are subject to change. Any price and availability information displayed on http://www.amazon.com/ at the time of purchase will apply to the purchase of this product. The VenTech Fan has been modified to establish a superior air flow and be suitable for various environments such as hospital rooms, indoor growing rooms, commercial cooling and more. The fan features a superior aerodynamic body made of steel construction with powder coated baked paint for stability and maximum efficiency. Disclaimer- The use of Ventech products should be installed professionally and not in enclosed areas. Buyer represents that by purchasing Ventech products, buyer has special knowledge or has consulted a professional on product’s use. In no event will the Company or any of its subsidiaries or their parent companies be liable to you for any direct, special, indirect, consequential, incidental damages or any damages of any kind even if the Company has been advised of the possibility thereof.